Dr. Sol Taylor: Our Odd-Denomination Coins. Some of America's odd-denomination coinage: A half-cent from 1825, left; a silver three-cent piece from 1856, bottom right; and its successor, a copper-nickel three-cent piece from 1881, top right. n the history of United States coinage starting with 1793, we have issued several denominations of fairly short duration. Some denominations were phased out for economic reasons, while others were not well received by the public. One of the earliest of our coins was the half cent, a pure copper coin about the size of a quarter but thicker and heavier. It was issued for most years between 1793 and 1857. They were similar in size to the English half penny of the same era and had a valid economic purpose. None was issued in 1798 and 1799, and none from 1812 to 1824, and none again between 1836 and 1848. The final issues ran from 1849 until 1857, when the value of copper exceeded the value of the coin and most were hoarded. The two-cent piece was introduced in 1864 to offset the shortage of small change in many parts of the country. After its first two years of issue, production was reduced each year until 1873 when only about 1,100 proof specimens were made for collectors. In 1872, only 65,000 were minted and distributed to a few banks. This denomination circulated for several years more, and disappeared from commerce shortly thereafter. In 1851 the Mint issued a silver three-cent piece  our smallest coin. It coincided with the first-class postage rate at the time, and it met the shortage of small change as well; since the large copper coins of the period rarely circulated, they were worth more as scrap copper. Because of its tiny size  less than half the size of a dime and fairly thin as well  the silver three-cent pieces bent easily, got lost easily, and rarely circulated outside bigger cities in the East. Again, after a few years of high production  1851 to 1858  mintage numbers dropped off sharply. For the period up to 1873, virtually none was issued for commerce and only a few hundred each year were struck in proof condition for collectors. These dates are quite scarce today and in mint condition bring hundreds of dollars each. To continue the three-cent denomination, a larger three-cent piece was introduced in 1865, made of a copper-nickel alloy. It was the size of a dime with a plain edge. 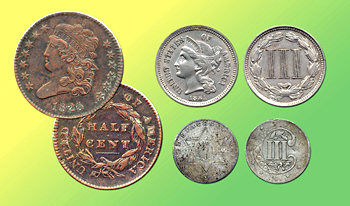 Like its silver predecessor, the first few years saw high production, starting at more than 11 million in 1865 and dropping steadily each year until 1881 when one million pieces were minted. The denomination officially ended in 1889. Several of the later dates are very rare in mint condition and can bring several thousand dollars each at auction. In 1875, the Mint brought out the 20-cent piece. Canada already had such a denomination, and the Ñdouble dimeæ seemed like a good idea as an intermediate between the dime and the quarter. Most of the new coins were minted in San Francisco, with a total of 1.1 million pieces released. But the similarity in design and size to a quarter made it an instant failure, and it was discontinued the next year with a very small mintage. In 1877 and 1878, collector specimens were minted and none circulated. These last two dates are worth thousands of dollars. Throughout most of our coinage history, the United States minted gold coins until we went off the gold standard in 1933. The usual gold coins for most of that period were $1, $2.50, $3, $5, $10 and $20. The oddity in the series, the $3 gold piece, started in 1854 as a mate for the three-cent coins and as a means to coin much of newfound gold in California and other states. Most years, the total number of coins minted was very small, compared to the other gold denominations. The most common date, 1854, had 138,000 pieces minted. Many years up to the end in 1889 had fewer than 10,000 pieces issued, and some years far fewer. In mint state, any of these coins would be worth several hundred dollars, and for the low-mintage dates, several thousand dollars. The unique 1870-S catalogs for $1.5 million. In 1879, the Mint issued two designs of $4 gold coins. They were basically patterns for future coinage and were never accepted as circulating coinage. Only 435 were made in 1879 and only 25 in 1880. These rare coins bring more than $100,000 at auction and rarely are offered for sale. The 1880s can top $1 million if offered for sale. Finally, the highest denomination ever issued was the pair of $50 gold coins in 1915, honoring the opening of the Panama Canal. These pieces were not intended for commercial use and were sold at the Panama-Pacific International Exposition in San Francisco to a few moneyed collectors. Four hundred thirty-five pieces in the round design were sold, and 645 pieces sold in the octagonal shape. Each coin is well worth more than $100,000. There have been suggestions for other new denominations such as the 2-1/2 cent piece and $2 coin, but nothing has ever come of them.